H x W x D 930 x 420 x 500mm. 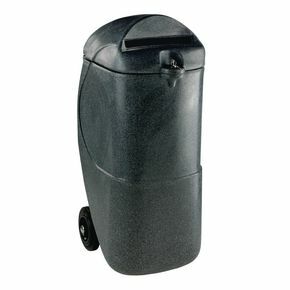 This mobile bin looks stylish and simple and its design allows it to look great anywhere. It has large wheels for extra mobility so you don’t have to worry about transporting it from one space to another. With this bin, security is not an issue as it is fully lockable so you don’t have to worry about keeping it safe. This bin has an impressive capacity of 90 litres and it boasts a height of 930mm, a width of 420mm and a generous depth of 500mm. This is a confidential bin that comes with a 12 month guarantee for your peace of mind.